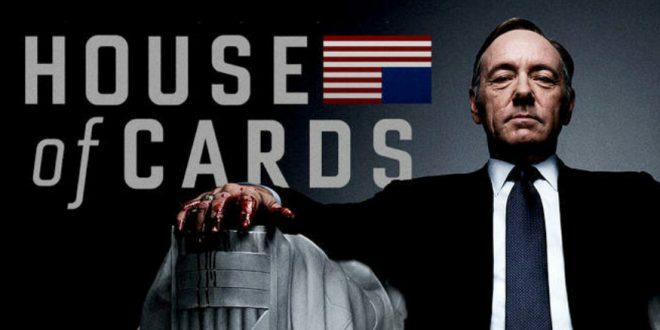 Netflix Announces End Of House Of Cards - Joe.My.God. Frank Underwood’s Washington tenure is coming to an end. Netflix is currently in production on a sixth and final season of House of Cards, the landmark drama that signaled its aggressive push into original programming. The final run of House of Cards, which stars Kevin Spacey and Robin Wright as ruthless and ambitious beltway couple, will debut its last 13 episodes in 2018. Executive producers Melissa James Gibson and Frank Pugliese, who replaced exiting creator Beau Willimon last year, are both expected to return as co-showrunners. Official word on its conclusion, which has been in the works since the summer, comes at a problematic time for Spacey. The star and executive producer is embroiled in sexual assault scandal, with an actor alleging that Spacey made aggressive advances towards him when he was just 14. Spacey responded, in turn, by apologizing for “inappropriate drunken behavior” and coming out as gay. Neither the apology nor the admission have been met with a positive response. Earlier today Netflix issued a separate statement saying they are “deeply troubled” by Anthony Rapp’s allegations.